The Faulkner Ranch is one of the finest turn-key ranches available in all of the Texas Hill Country. When first driving onto the ranch, one cannot help but notice and appreciate the superior land management that has been faithfully practiced. Owned and operated by the same family for nearly 25 years, this established ranch is primed for a smooth transition to its next owner. Located in southwestern Kerr County just west of the charming town of Hunt, this 4,540 +/- acre ranch is a haven for both native and exotic wildlife. Completely high-fenced, this ranch has frontage on both Highway 39 and FM 187 for easy accessibility. Using all of the tools at the owners disposal, including prescribed burning, the majority of cedar has been removed from the completely game-fenced ranch. 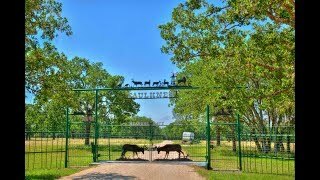 The ranch is also divided into three game-fenced pastures of 3,473 +/- acres, 667 +/- acres, and 400 +/- acres. Fields of thick native grasses along with abundant vegetation for wildlife have been enhanced by a rotational grazing program. The ranch is intermixed with a variety of oak trees including post, red, Spanish, blackjack, lacey, shin, and heritage live oaks. Walnut, pecan and hackberry trees are also present. Because trees are valuable to the habitat and the views, the owner sited 13 +/- miles of chip-sealed roads to avoid cutting down trees. The paved roads provide easy access to most of the ranch and were resurfaced four years ago; well maintained conventional ranch roads keep the remainder in reach. Trees lining the paved roads have been trimmed, so its easy to view the abundant wildlife. One of the propertys most unique features is a cavern with beautiful limestone formations and several rooms suitable for exploration. A walkway winds through the caverns, guiding visitors along the inner space labyrinth of surreal formations varying in shape and size. Multiple chambers show impressive stalagmites rising up from the cave floor, stretching to reach stalactites suspended from the rock ceiling, forming soda straws and limestone chandeliers. The headquarters main compound, located on the ranch&apos;s eastern edge is a short drive from the entrance, and is situated on 9.5 acres enclosed within a game-proof fence. It includes the main house and attached garage with two guest apartments. The 5,460 +/- sf main house, affectionately called The Big House for the size of its welcome, is the compounds centerpiece. The current owners have applied their vision and creative style to elevate the original 1940s ranch house into an inviting home that brings the outdoors inside with warm wood, solid stone, and plenty of light! The master suite of this 4 bed 4 bath house is a perfect example of the seamless transition between outside and in. The suite, which measures 40 x 36, features a walk-out deck so residents can enjoy private views of the hummingbirds in the garden with the rest of Texas beyond. The houses heart for entertaining is evident in the living room with its massive fireplace and a wet bar, a dining room, game room with a fireplace and a trophy room with two fireplaces. Exposed wooden beams, tightly formed rock walls, and exposed ductwork combine for a prime Hill Country rustic elegance look and feel that beckons people to gather. More than 1,300 +/- sf of covered porches provide the perfect perch for enjoying early morning coffee, a late afternoon cocktail, or from the swing overlooking the oasis of the landscaped yard. The 2,700 +/- sf attached garage includes two 1 bed 1 bath 20 x 8 apartments; one with a kitchenette. Their location makes them ideal accommodations for overflowing guests. The sleeping quarters barn encompasses 7,500 +/- sf . Within its six bays, there is a complex that includes three single-wide manufactured homes ranging from 720 +/- sf to 840 +/- sf with a total of 7 bedrooms and 4 baths between them, a restroom building with 2 complete restrooms including showers and a combination laundry/mudroom, and Donnas Diner, a 336 +/- sf kitchen outfitted with commercial equipment and granite counters. The bunkhouse barn also features an enclosed shop with 2 overhead roll-up doors. The foremans residence is a 1,820 +/- sf double-wide manufactured home, which sits on a pier-and-beam foundation, and is faced with hardi-plank and roofed with metal. It is fenced and landscaped. The 4 bedroom 2 bath home includes a fireplace, a Jacuzzi tub and a laundry/mudroom. The 6,250 +/- sf equipment barn is built to last with a metal frame, metal roof and concrete slab. It houses the walk-in cooler and game processing area. There are also 2 metal frame carports, both 20 x 24 with metal roofs. The restored 1910s one-room schoolhouse is approximately a 392 +/- sf building, and has been restored to include one bathroom and one bedroom. Close by a rock pila has been converted to a swimming pool that is equipped with a shaded deck. Together they are a cool destination for guests in Texas summers. The Faulkner Ranch has been managed to provide exceptional habitat for wildlife. Daybreak finds an abundance of white-tailed deer, wild turkey, dove, as well as axis deer, fallow deer, blackbuck antelope, red deer, barasinga, and feral hogs. Native whitetails are managed under a Level III Managed Lands Deer Permit, which allows for deer hunting from October to February. Supplemental protein feeding is also a regular practice. While the ranch is currently used as a private hunting retreat for family, friends and select non-profits, it is well suited as a commercial hunting operation. Groundwater is plentiful and easily accessed by one of Faulkner Ranchs 15 wells which are outfitted with a mix of solar and electric submersible pumps. Water is also piped to troughs and storage tanks throughout the property. In addition, there are five stock tanks; the largest of which covers 4-5 acres at full capacity. The South Fork of the Guadalupe River transects the northern and eastern quadrants of the ranch but only holds water during wet spells. Thanks to years of care and attention, the Faulkner Ranch has been conscientiously stewarded. The Faulkner Ranch is located approximately 30 miles west of Kerrville on Hwy 39.